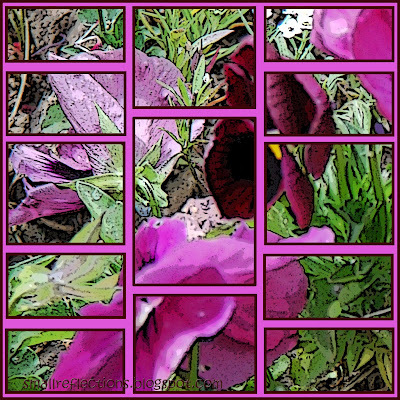 in Window Views, Purple Passion Photo and Thursday Thirteen. and Colorful T-13 at Sacred Ruminations this week. What a clever way to do Window Views! Love the poster edged pansies. Beautiful Mosaic! Love the colors in the pansy's. Have a great day! One of my all time favorites of your always delightful photos! Pretty idea for a T13! Very colourful take on the theme, yes! Happy week-end! This is so very clever! A mosaic that creates a window on Nature! So beautiful! Wow! how lovely and clever. I love looking at windows that way. Have a great week. What a lovely, lovely stained glass effect!